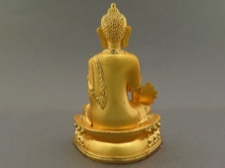 Beautifully detailed, gold plated brass Medicine Buddha ideal as a desk companion or for a personal altar. 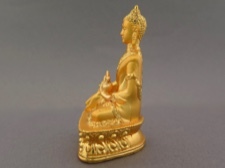 Statue is 3.5 inches tall, its base is just over 2 inches, and the bottom is soft red felt. 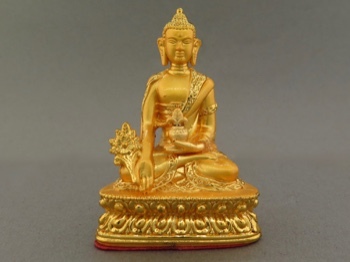 The medicine Buddha is considered the Supreme Healer, and is revered for his healing powers. He also is invoked for overcoming inner sicknesses like hatred, prejudice and ignorance. His followers believe he can help cure physical illness and purify negative karma. A very powerful and thought provoking diety.